This Fisherman was already having a pretty unbelievable day, but when you see the camera pan to the left and you see that there are even more bald eagles than you previously imagined? WOW! That’s a once-in-a-lifetime experience, fortunately everyone has a camera in their pocket at all times so it was all captured on video. Watch below, we’ve never seen so much freedom in one place before! If you’re looking for high quality and personal service, you’ve come to the right place. At Texas Helicopter Pig Hunting we’ll give you the attention and personal service you’ll come to expect and enjoy. We offer the best in Helicopter hog hunting. Our rates are competitive, with no hidden fees. Our employees are friendly and will be there to help you every step of the way. Texas Helicopter Pig Hunting has over 650,000 acres of private Texas land with ranches throughout the state to better serve our customer base. Let us put our experience to work for you. We offer the best Helicopter Hog Hunting in Texas, with more Helicopters to choose from, more land to hunt, and we always have Hogs to Hunt! We offer a Charter Service to help our Hunters with Logistics so that you don’t have to worry about getting to and from your Hog Hunt. Daniel Bradford shot this stunning footage in Northwest Montana. After finding fresh scrapes, he decided to utilize a hand call in the hopes of luring a big cat in. He got his wish – and from a front-row seat, at that. Click here to go to Daniel’s Youtube channel for the video of the whole encounter! Check out the intense stare on that cat. Yikes! If you think Bradford was sitting safely inside a locked vehicle, think again. He was sitting on the ground, back against a tree, wearing a pair of blue jeans. The cat was a mere sixteen feet away when it noticed him. It’s not official yet, but this sure looks like the new South Carolina record buck to us. Twelve-year-old Justin Hodges from South Carolina might have just shot the biggest buck ever taken in the state. His buck green-scored at 178 inches, and as of now, it tops the previous buck of 176 inches standing since 1994. Justin and his father had seen the big buck back in October during bow season but never got a shot. It wasn’t until they set up on an old road bed near the area where the saw the buck before that fate opened its window and offered an opportunity. “Justin already had the gun pointed down the roadbed and when the deer stopped a couple of seconds later, he pulled the trigger, but nothing happened,” his father said in an interview. As most of us know, when a big buck shows up, strange things happen. As in this case, Justin forgot the safety. After realizing his mistake, another pull of the trigger dropped it in its tracks. Measuring out to 19 total points, 12-inch brow tines, 13-inch G2’s, 13-inch G3’s, and very thick mass, it stands a very solid chance of beating the record. Congrats Justin! What a deer! Tim Sundles, proprietor of Buffalo Bore Ammunition is no stranger to bears. An avid hunter and outdoorsman, Sundles believes in the protection offered by a sidearm while in bear country. However, Sundles is acutely aware that the .44 Magnum and its bigger brethren are typically too much for the average person to manage, particularly under duress. With that in mind, and the typical carry gun playing double duty in the outdoors, Sundles set about to create pistol loads that could turn the average personal defense pistol into a credible bear defense weapon. Sundles stated: “So many people have one pistol, for street carry or home defense. We wanted them to have a viable outdoor load when they go camping, hiking, or fishing.” Well aware of the positive attributes offered by flat-nosed hardcast bullets in bigger calibers on large game, Sundles created a line of ammunition dubbed “Outdoorsman,” in 9mm, .38 Special, .357 Magnum, .40 S&W, 10mm and .45 ACP, featuring a heavy for caliber hardcast, flat-nosed bullet for uncompromising straight-line penetration. Developed and thoroughly tested by Sundles, the Outdoorsman turns the average carry pistol into a sidearm more suited for stopping physically bigger threats than man. For more information, go to BuffaloBore.com. Officials with the Boone and Crockett Club and the Pope & Young Club say a Montana hunter may have bagged a new world record elk. In a press release issued on the club’s Facebook page, the group said the elk had a green score measurement of 429-6/8 net and 448-4/8 gross. The current Pope and Young Club’s World’s Record typical American elk, taken in Arizona in 2005, scores 412-1/8 points. “This bull may well be the largest typical American elk taken in the last 48 years,” said Boone and Crockett’s Director of Big Game Records, Justin Spring. 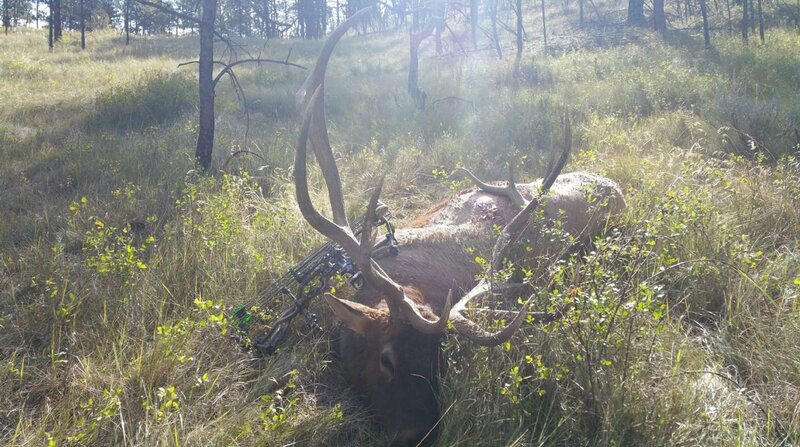 The elk was taken by a resident hunter on a solo hunt early in the archery season. The antlers need to dry for 60 days before an official score can be made, the release states. This hunter’s wife and daughter both turned down chances to shoot this incredible world-class whitetail. Nick Starkey has a pretty unselfish family. It showed last week when he bagged what could potentially be the new state record typical whitetail. His awesome buck came after both his wife and daughter turned down opportunities to shoot the massive animal. The 15 point monster, taken in Upshur County near BuckHannon, has green-scored 191 2/8, putting it well above the old record of 185 4/8. Of course, Starkey will have to wait for the 60 day drying period to end before an official measurement by Boone and Crockett can take place. Originally, Nick was hopeful his wife would be able to take the potential record buck. But in a surprising move, Angie, who told the paper she cared more about getting meat in the freezer than a trophy buck, gave up the spot to her husband and daughter for opening morning. Apparently, it was his excitement over the buck that caused her to give up her spot. “That picture set him into a mode that he was so excited he couldn’t sit still,” she told the paper. Still, Nick apparently planned to have his daughter shoot the massive buck if it made an appearance. But when the buck showed up late in the evening, Raven decided she wanted her dad to take the shot instead. “She was telling her dad, ‘Shoot him dad, shoot him,’” Angie told the paper. So for the second time, a member of his family passed on the opportunity to bag the record buck and Nick finally had his chance. The buck ran a short ways over a hill and collapsed after the shot and Nick’s goal of killing a big buck was fulfilled. No doubt he’ll be thanking his wife and daughter for a long time for passing on the opportunity on this one. It just goes to show nice guys don’t always finish last! We’ll continue following this story to see if it indeed does break the record following official scoring. Another wolf hunt is being held in Saskatchewan. Ministry of Environment officials said the hunt is needed to reduce wolf-livestock conflicts. “Livestock predation by wolves is an ongoing problem for producers in areas near the provincial forest,” Environment Minister Scott Moe said. Licences for the hunt, which will run from Oct. 15, 2016 to March 31, 2017, are only available to Saskatchewan residents and have to be picked up in person. Hunters will also be required to report their results within 14 days of the end of the season. Those who fail to report will not be allowed to purchase licences until the reporting requirement has been met. Officials are reminding those taking part that wolves are considered a big game species and all regulations around weapon type, clothing requirements and baiting apply. The wolf hunt will take place in wildlife management zones 43, 47, 48, 49, 50, 53, 54, 55 and 68N. A man’s efforts on a small north Georgia stream were rewarded when he landed a rare golden rainbow trout last week. Georgia Outdoor Newsreports that Zach Baker, 27, of Maysville, Georgia, caught the fish on a stretch of public water he declined to name. Baker says that three weeks prior he’d seen a golden-colored trout there and then fished the spot once a week in an attempt to catch it. According to the Pennsylvania Fish and Boat Commission, in 1954, a West Virginia hatchery created the golden rainbow mutation from a single fish. When that first fish, which had a blend of golden and normal pigmentation, was bred with a rainbow trout with normal pigmentation, their offspring eventually developed the bright colorings of the golden rainbow trout. The mutation is only a variation in coloration, however, and should not be confused with California’s native golden trout. According to the Georgia Department of Natural Resources, a permit is required to release any wildlife, including fish. Interesting enough, this isn’t the first odd trout caught in Georgia recently. In January, Brigadoon Lodge, located on a private stretch of the Soque River in north Georgia’s Chattahoochee National Forest, posted a photo to Facebook of an angler holding a golden rainbow trout. Also in January, Orvisnews.com shared a picture of a tiger trout caught on an unnamed stream also in north Georgia. On Sept. 24, 14-year-old Nebraska hunter Hannah Helmer shot an elk that could be a new state record. The teenager’s dad, Joel, an official Boone and Crockett scorer, green-scored the rack at 428 1/8 net, Omaha World-Herald reports. The current state record stands at 409 7/8 for a nontypical elk, and the typical state record is set at 390 3/8. The rack of Helmer’s bull must dry for 60 days before it can be officially scored, though it seems likely that it will have no problem securing the record.